Keep the crunch of fried chicken without piling on the calories. The secret to super-crisp roast chicken skin: giving the bird a good rubdown. Cook this recipe on a Sunday and carry the leftovers into the week—the meat makes a great chicken salad for sandwiches. 1. Salt the chicken thoroughly the night before cooking, being sure to spread the salt into the cavity and under the skin. When you’re ready to roast, preheat the oven to 450°F. Drizzle the chicken with half of the olive oil, and then rub the oil and 2 tablespoons of the fresh herbs all over and under the skin. 2. Combine the vegetables in a large baking dish. Sprinkle on the remaining olive oil and herbs, plus some salt and pepper. 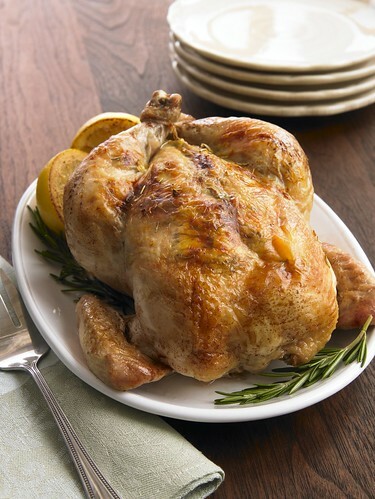 Perch the chicken on top of the bed of vegetables and place the dish on the middle rack of the oven. 3. After 20 minutes, lower the heat to 375°F and continue cooking until the chicken’s skin is thoroughly brown and crisp, and a thermometer inserted into the thickest part of the thigh reads 165°F. Makes 4 servings. The recipe is designed for the hot days of summer, when you need a hearty meal quick. The bright seasonal veggies pair perfect with pesto shrimp. The skewers making cooking (and eating!) easy. Instant upgrade: Blend fresh basil with toasted pine nuts, Parmesan cheese, and olive oil for an easy homemade pesto. 1. Soak the skewers in cold water for 20 minutes. Meanwhile, toss the shrimp with the pesto and let it sit for 15 minutes. 2. As the shrimp marinate, chop the peppers. Next, warm the olive oil in a medium sauté pan over medium‑high heat. Add the corn, zucchini, and peppers, and sauté until they’re lightly browned. Add the tomatoes and cook for another 3 minutes, until the skins on the tomatoes blister lightly. Turn off the heat, season to taste with salt and pepper, and add the basil. 3. Skewer the shrimp and cook them on a hot grill for 2 minutes a side, until they are pink and firm. Serve the shrimp on top of the succotash. Makes 2 servings. Sometimes, it just feels good to eat with your hands. Roll up your sleeves and try these healthy wraps, which skip the bread for lettuce cups. Double the recipe and you have a fun family meal where everyone can customize their bites. 1. Heat the grill or grill pan over high heat for at least 5 minutes. Season the steak with salt and pepper and toss it on. Cook for about 4 minutes on each side, until it’s firm but yielding to the touch. Let it rest for 5 minutes. 2. Combine the chili sauce, fish sauce, and juice of one lime in a small saucepan over low heat. 3. Slice the steak thinly (if it’s skirt or flank steak, be sure to cut against the grain) and drizzle half of the warm sauce over it. Set out the jalapeño and onion slices, cilantro, carrot, lettuce, and remaining lime wedges and sauce. Use the leaves like tortillas to wrap up the steak slices with the other ingredients. (Save some lime and sauce to use on your wrap as you eat. )Makes 2 servings. Ground beef tacos often cook up too greasy to match the bright, fresh flavors of taco night. Switch up your protein and try mahi-mahi, a meaty fish that partners well with zesty lime juice, sweet mango, and aromatic cilantro. 1. Clean and oil a grill or grill pan thoroughly. Preheat to medium-high. 2. Make the mango salsa by combining the mango, avocado, red onion, cilantro, and the juice of one lime. Season to taste with salt and pepper. 3. Drizzle a light coating of oil over the fish, and rub on the blackening spice. Place the fish on the grill and cook, undis-turbed, for 4 minutes. Carefully flip with a spatula and cook for another 4 minutes. Remove. Before turning off the grill, warm the tortillas directly on the surface for 1 to 2 minutes. 4. 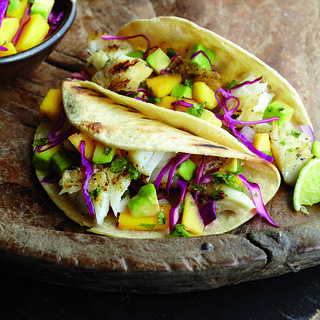 Divide the fish evenly among the warm tortillas, add a bit of cabbage, and spoon the salsa on top. Serve each taco with a wedge of lime and 1/2 cup of black beans spiked with cumin. Makes 2 servings.